Ten From The Nations is a hard book to read, to digest, to understand. It opens a door not only to a world. But the world is one that I know little about, a world that is (and should be) completely foreign. Dr. Rivkah Adler is a close friend and a brilliant writer. When I heard she’d written a book, I was anxious to read it. The topic made me uneasy. 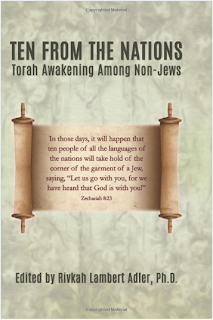 Ten From The Nations is a book about “Torah awakening among non-Jews.” As I read Rivkah’s book, the thought, “but do we want non-Jews to be ‘awakened’ to our Torah?” stayed firmly in my mind. According to tradition, many nations were offered the Torah. Each asked what was in it, and when told, refused. By contrast, when the Jewish people were offered the Torah, we answered, “we will do, and we will hear” – meaning that we committed to accepting Torah, and only then asked what this involved. Torah and I have a very special relationship. At constant and varying points in my life, the Torah has spoken to me. Long ago, someone told me that if you counted the versus of the Torah and matched them to the equivalent value in years (according to the Hebrew counting), some amazing visions are offered. During the years equivalent to 1939-1945 (Devarim 29-22-28), the passages speak of a great fire across the land. More, the year in which Israel was created (1948) speaks of the ingathering of the Jewish people to their land; and for 1967, the corresponding Torah verse speaks about not crossing the Jordan River. In the Six Day War of 1967, on our eastern border, we conquered all the land up to, but not over, the Jordan River. Within the words of the Torah, lies not only our past, but our present and our future. And that, to me, is the main point in my relationship with the Torah and the concept of Christians studying and immersing themselves in Torah. Up to the point of Noah, the Torah tells the history of all mankind. But that was more than 5,000 years ago. From that point, the history of man divides into the three sons of Noah. Later it divides further, according to the two sons of Abraham. In her opening pages, Rivkah (Dr. Lambert Adler) provides an invaluable warning to her readers. In the section on “Issues for Jews”, speaks of Jews who are “strongly opposed to any cooperation between Jews and Christians. They believe that all Christians are dangerous and duplicitous and ultimately want to convert all Jews and/or wrest the Torah from the hands of Jews”. Before reading the book, I stopped for a while at that question. Am I one of those people? If so, there was really little reason to continue reading the book. It took me a few days (at least) to decide that I did not belong in that category. I have firm lines of what I believe Jews and Christians should not do. One of them is marry each other. I was grateful when the book recognized the “cultural appropriation” that permeates many of the entries in this book. Rivkah also writes about those Jews “who want to retain Torah for themselves” and I agree with her assessment that “for them, the grey area that this book explores is a very disquieting place.” It was indeed. What follows are thirty-seven stories written by various “shades” of Christians/non-Jews. This section is followed by twelve short essays from Jews. Reading through the essays by Christians, I tried to keep an open mind. I tried to feel that they weren’t speaking about something that was “mine” but rather something God had given to the world. Repeatedly, I felt that the Christians were thanking the Jews for honoring or keeping “their” Torah until they had come to the presence of mind to reclaim that which God really meant for them. But…but…no…wait. My mind rebelled and I stopped reading the book for a while. It’s hard for a Jew to read this and be unable to voice his/ her opposition. No, God offered you the Torah and your refused. Then God gave it to us. End of story. End of game. You can read the Torah whether you are Jewish or not, and I recommend you do. You can learn the lessons and hopefully strive, as Jews do, to be better people as a result of the study of Torah. What you cannot do, I wanted to say several times as I read the essays, what you cannot do is take what is mine. You can borrow it; even enjoy it. But, you cannot claim it. Getting through some of the essays were very hard; others made me feel better. So I began to read and, in truth, wondered if I was wrong about my first assumption. Maybe I was one of those that Rivkah wrote about in the introduction. What was I objecting to? What was I fighting against. Do I feel that it is wrong for Christians to read and study the Torah? The answer was and is no. I’m happy to share it. But while I appreciate the sentiment, I disagree with the writers who claimed the Torah as theirs. “For the first time, I understood that the Bible was telling my family history. It was my ancestors who were freed from Egypt, who received the Torah at Mount Sinai, who built up the Kingdom of Israel” writes, Britt Lode, one of the “Voices from the Nations,” in the book. But it doesn’t tell your family history, I want to explain to Britt. You didn’t receive the Torah at Mount Sinai and it wasn’t your people who built the Kingdom of Israel. I love how you appreciate the Torah, I would tell her. And it is so very clear that you love the people of Israel, I would say. She writes that the redemption is “just around the corner” and I agree with her. She writes beautifully about my people and my land, and I am honored that a Christian in Norway sees so much that so many others refuse to see. There are many things in life that we can come to respect, even love. That doesn’t make them ours. The right to study the Torah is open to all. The right to claim it, is not. It can’t be yours so long as there is a place in your heart dedicated to Jesus and to a religion that is in direct contradiction to the Torah. If you believe that Jesus is both the son of God AND God, you violate the most basic concept of the Torah that Abraham, Isaac, Jacob and generations of Jews have dedicated their lives to. There is only one God, and God is One. In Jim Long’s essay, I found reference to a Torah sentence that I have always loved. It is found in the book of Shmot (Exodus), where God commands Moses to go speak to Pharoah and tell him, “You shall say to Pharoah, ‘So said Hashem, My firstborn son is Israel’.” I enjoyed his essay and his understanding and respect. “I was not troubled by the fact that I’m essentially Israel’s younger sibling.” He charges Israel with the responsibility to “care for the rest of us in God’s family” and I wanted to cheer. Exactly this. This is the relationship that I can embrace. Perhaps, I reconsidered, Rivkah wasn’t including me in those that strongly oppose any cooperation between Jews and Christians. Another essay, by Albert McCarn, suggested that “The Jewish people are very much Israel, but they are not all of Israel.” He may be right, but how does that translate to Christians awakening now to Torah being a part of Israel, the missing ten tribes. “We are learning that we are Hebrews, but we are not Jews.” I have to confess, I don’t even understand what that means. At times I longed to get to the end, to the other side of the river I felt I was swimming through. I knew from the table of contents that the other side would be 12 essays by Jews. To some extent, those sections also left me wanting something different. In the essays written by Jews, there seems to be many who feel they have to justify their associations with Christians. Clearly, as Rivkah had written at the outset, this bridge she and others were trying to build is suspect and surrounded by land mines. Truly, I think the land mines are greater than my friend gives credit. And yes, part of this is, as she and others say, because of the history between Jews and Christians. But more, if we are truly close to (or even in) the end of days, do we have the time to divert our attention to helping others do something they don’t have to do, while failing to move our own people to do what they have to? Having swam across the river, I climbed to the other side to read the section written by Jewish authors, including several that I know personally and/or respect completely. And yet, here too, I was left with the feeling that something was off. Too often in this section, I felt the Jewish authors went too far in their attempts to justify the dialog they are seeking to establish or expand. In one essay, one author wrote that he has “come to realize that my Christian friends have chosen a wonderful savior with values that can truly make the world a much better place.” But…but…but. How does he know that their savior was wonderful? Even one of the “Nations” authors questions the very existence of Jesus and yet here is this Jew deciding that not only did Jesus live, but that he was wonderful. And weren’t the values he would have had a reflection of the religion he practiced? Jesus was a Jew. He had, we think, Jewish values…except for the ones he broke. Without question, according to the Christian Bible, Jesus proudly broke the Sabbath in order to feed the hungry. Was there no other way to feed them but the way that Jesus chose? Truthfully, we don’t know the answer, do we? We have no proof. But what Jesus kept or broke is not the point. In another essay, the author points out how a Jewish audience in her class exhibited a “bored silence and no one had anything to ask or add” while a class she and her husband held for a Christian community resulted in “enthusiastic interest and lots of fervent discussion.” This too bothered me. Do you have to show the strength of the interest some Christians have by belittling the interest of a “Jewish audience”? What spurred me to write this review was another review, written by Varda Meyers Epstein, another writer that I very much respect. In the coming days (perhaps hours), Rivkah will respond to Varda (on Varda’s blog) and the dialog will continue there. For now, I feel like someone in the audience, listening while whispering to someone at my side (in this case, the readers of Israel Blogger) that I too read the book, and I too had my concerns. What Rivkah Adler succeeded in doing, is putting before our eyes some very important questions. Her book presents a reality that many of us have blissfully been unaware of. Yes, I agree with her evidence that there is indeed a Torah awakening among non-Jews. We have always know that we are to be a light to the Nations. And I believe we are. I believe Israel is. Do I believe that Jews should be assisting in the wave of this awakening? I have written several blog posts on this subject which are well worth the time of anyone who is really interested in understanding it. I urge everyone to read, at least, the first one and also take the time to view the video clips. Thank you Paula for the post reviewing Ten from the Nations by Dr.Adler . I shall not make any comments . But I will continue to pray for you and the people of Israel , the apple of God’s eye that you and your beloved people may behold the Lamb of God which takes away the sin of the world . The Bible answers the question : How do the Nations fit into the Final Redemption ?. In the divine economy the Jew , the gentile Nations and the Church of God – all are precious in His sight . He has an un unchanging plan and purpose for all of them according to the good pleasure of His will . Also continuing to pray for the Nations of the world to know the true living loving God of the Bible . The Torah which you and I love finds it’s complete and perfect fulfilment in Lord Jesus Christ . In Him we are one . HaShem does not turn the Gentiles away why should we? and peoples will stream there. to the house of the G-d of Ya‘akov! the word of HaShem from Yerushalayim. and arbitrate for many nations far away. Paula, we as Jews do not have a claim to G-d, for He is a G-d of all people and only HE determines who is His and who is not. There are man so called Jews who do not keep Covenant in obeying HIM and are Jews in Name only. When you go back to the true TORAH and not the Talmud and other commentaries you do not find any mention of G-d offering His Covenant Laws to any other nation of people and all of them rejecting them but Avraham’s seed. That is a made up fantasy. G-d chose our Father Avraham because Avraham chose G-d while the rest of the world chose false gods. Now listen carefully to what I am about to say. G-d did not choose the Jewish people because we were any better than the Gentiles. Get that through your head. It is not about Religion…. it is about our G-d and HIS COVENANT which HaShem made with our Father Avraham, then He renewed that COVENANT with Isaac, and Jacob and at Mt Sinai with the 12 Tribes of Israel. That Covenant is to be kept by obeying the Laws of G-d that He gave to His People. We were given a responsibility to go forth as HIS LIGHT unto the nations. That means we are to bring His Words, His Teachings and His Laws to all the people of the earth by LIVING OUT these Words in Covenant with our G-d. Thus enters your thoughts about the Christians….. you are correct. Here you are correct in stating that anyone who worships and serves Jesus is worshiping a false god which is breaking the the very 1st Commandment of G-d. So they cannot be in Covenant with the jewish people who honor that Covenant and obey our G-d. But lets look at other non-Jews who do not worship or serve Jesus or other gods or other religions but want to truly know and return to the G-d of Avraham, Isaac and Jacob….. Example: Ruth and Rahab. Ruth was the Great Grandmother of King David. We are not to push away those non-Jews who truly want to lean of our G-d and Return to Him under His Covenant. Our G-d is a G-d of all people not just the Jews. Remember that. These Goyim Gentiles who love our G-d and want to Teshuvah are the Foreigners that will live with us in the Land of Israel and they are to be treated as our own family. Now listen to G-d and His Word through His Prophets and I hope these questions will be answered………………………………. Jeremiah 16:19-21 ”O Lord, who are my power and my strength and my refuge in the day of trouble, to You nations will come from the ends of the earth and say, “Only lies have our fathers handed down to us, emptiness in which there is nothing of any avail! 20. Can a man make gods for himself, and they are no gods?” 21. Therefore, behold I let them know; at this time I will let them know My power and My might, and they shall know that My Name is the Lord”. As stated in Zachariah 8:23 the righteous of the nations will come to the Jews in the time of the end to learn the truth about G-d and as Jeremiah 16:19 states the righteous of the nations will turn to the same G-d that the Jews worship a non human G-d and they will admit that they inherited lies from their forefathers and will repudiate their idol worship. There is an interesting discussion in the Talmud avodah zara 10 b between Antonius a righteous Roman ruler and the great Jewish sage Rebbe Antonious asks Rebbe if he will enter the world to come. Rebbe assures him that he will. Antonius then replies “how can that be seeing that it is written in your scriptures there will be no survivors from the house of Esau Obadiah1:17-18. Rebbe answered that is if you act like Esau. This indicates that if you act like Esau you are part of the house of Esau so even if you are not physically from Esau you will be considered one from the house of Esau and will be destroyed but if you are a descendant of the house of Esau and remove yourself from it by not acting like Esau but instead throw your lot with Israel, you will be saved and inherit eternal life. Remember, Rahab the Prostitute and Ruth who were both Goyim Gentiles but came under the Covenant of the G-d of Israel and were counted as Righteous Jews. Ruth was the Great Grandmother of King David. King David was a man after G-d’s own heart. King David was a Jew. If only our Christian Gentile friends could learn from this very important lesson. There is only ONE G-D of Israel and HE is not a finite man… our G-d is infinite. Listen very carefully to what Jeremiah 16 says….. “the righteous of the nations will turn to the same G-d that the Jews worship a non human G-d and they will admit that they inherited lies from their forefathers and will repudiate their idol worship. Return to your First Love. Kelilah bat Chava – thank you for your comments, however it is my understanding from reliable sources that you are not only not Jewish but also an active missionary. While I am very much in favor of building bridges between Christians and Jews, I am not nearly as forgiving when it comes to missionaries. As for “telling God who belongs to him” – I’m not sure that anyone even tackled that subject so I’m a bit confused why you are mentioning it.